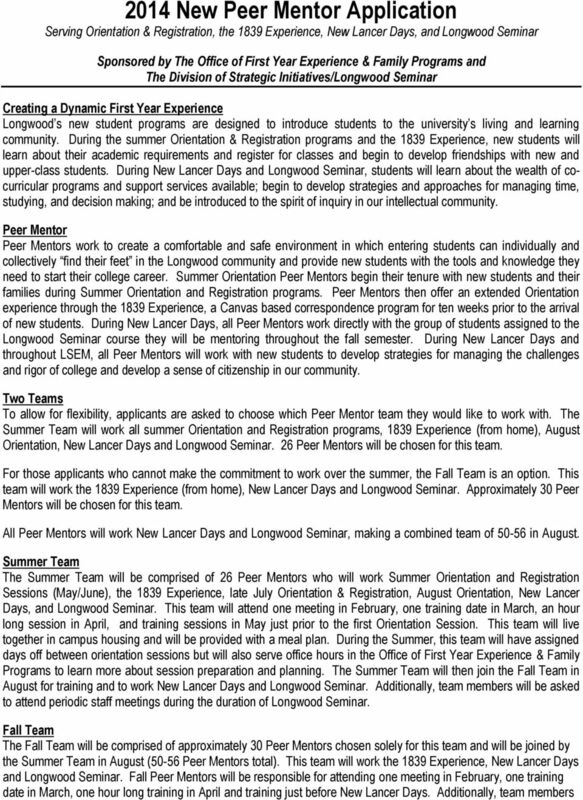 Download "2014 New Peer Mentor Application Serving Orientation & Registration, the 1839 Experience, New Lancer Days, and Longwood Seminar"
2 will be asked to attend periodic staff meetings during the duration of Longwood Seminar. This team will work closely with both the Director and Assistant Director of First Year Experience & Family Programs and the Director of Longwood Seminar. 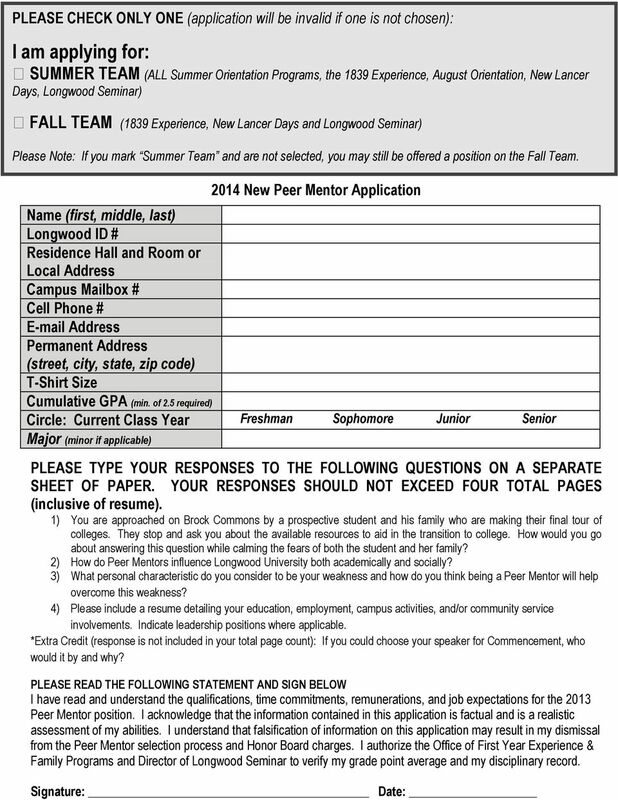 Responsibilities for Peer Mentor Attend and participate in all scheduled training/planning sessions in spring, summer, and August Share your Longwood experiences with new students and parents and help them understand the importance of academics and the value of co-curricular experience. Facilitate small groups of students and/or parents and help them navigate the campus. Maintain consistent and timely correspondence during the 1839 Experience. Assist with the design/selection and facilitation/implementation of topical programs (e.g. using mylongwood, time management, alcohol, relationships, transition, etc.) for New Lancer Days. Take your group to ALL programs during any Orientation & Registration program AND New Lancer Days. Collaborate with other Peer Mentors, RAs, faculty and staff as we work together to enhance the new student experience. Assist LSEM instructor in the design and implementation of the course. Inform LSEM instructor about developments and activities of the LSEM group. Attend all LSEM class meetings AND Peer Mentor meetings during the fall semester. Foster a sense of community and trust in the classroom by modeling appropriate risk-taking and selfdisclosure. Assist in developing an inclusive classroom environment that is open to all points of view. Help students become familiar with University resources (e.g. Residential and Commuter Life, Health & Wellness Center, Learning Center, Counseling, etc.) and make appropriate referrals when necessary. Serve as a role model exhibiting enthusiasm, motivation, and involvement. Exercise good judgment in representing the university and uphold institutional standards, including the Honor Code. Refrain from consuming alcohol or hosting guests on campus during Peer Mentor training, ALL Orientation & Registration programs, AND New Lancer Days. 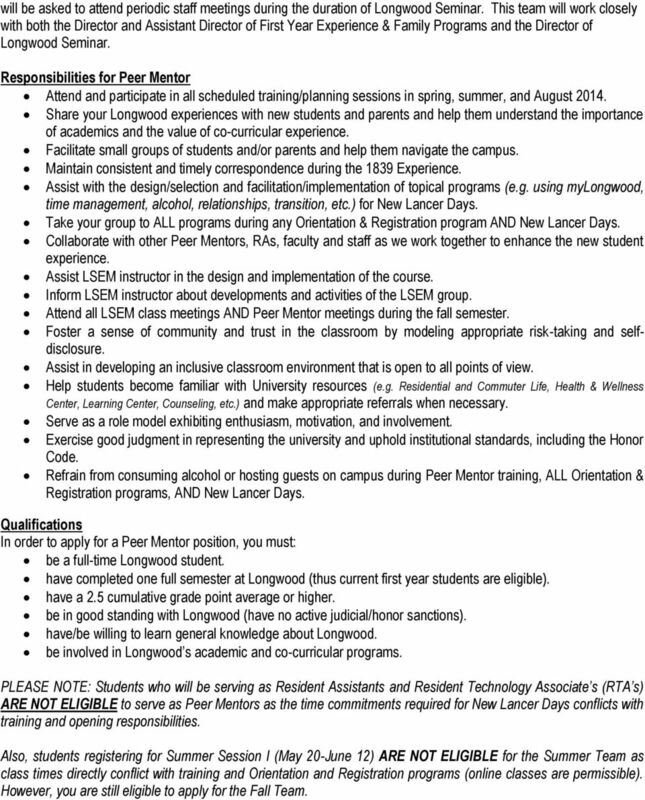 Qualifications In order to apply for a Peer Mentor position, you must: be a full-time Longwood student. 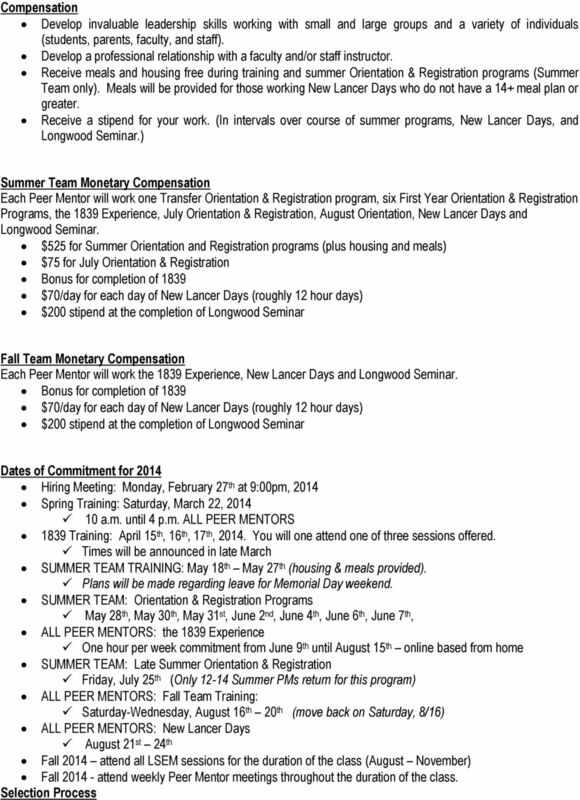 have completed one full semester at Longwood (thus current first year students are eligible). have a 2.5 cumulative grade point average or higher. be in good standing with Longwood (have no active judicial/honor sanctions). have/be willing to learn general knowledge about Longwood. 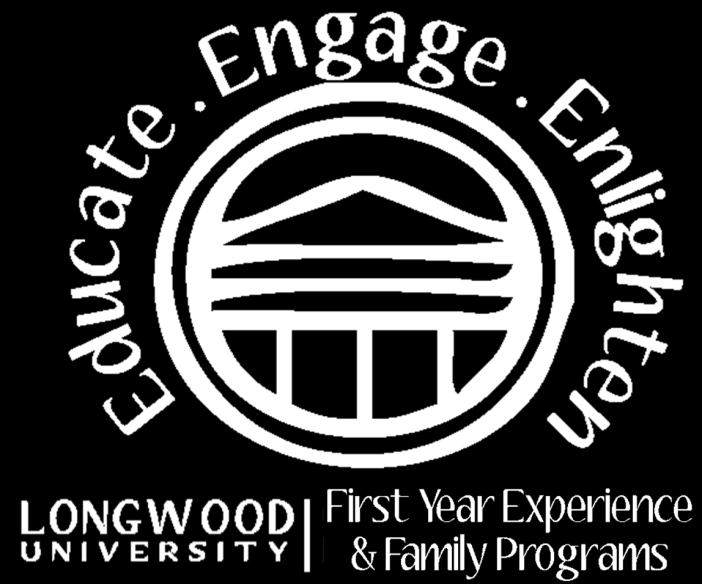 be involved in Longwood s academic and co-curricular programs. PLEASE NOTE: Students who will be serving as Resident Assistants and Resident Technology Associate s (RTA s) ARE NOT ELIGIBLE to serve as Peer Mentors as the time commitments required for New Lancer Days conflicts with training and opening responsibilities. Also, students registering for Summer Session I (May 20-June 12) ARE NOT ELIGIBLE for the Summer Team as class times directly conflict with training and Orientation and Registration programs (online classes are permissible). However, you are still eligible to apply for the Fall Team. 6 References Please provide three references that can attest to your character, responsibility and leadership abilities. Ideally, these references should be able to provide information about you on personal, professional, and/or academic qualifications. Recommendations letters from these individuals are not needed! Personal Reference Information: Name (Print): Title/Position: Organization: Office Phone: Relationship: Professional Reference Information: Name (Print): Title/Position: Organization: Office Phone: Relationship: Academic Reference Information: Name (Print): Title/Position: Organization: Office Phone: Relationship: Please note: Immediate family members and current staff of the Office of First Year Experience & Family Programs and Director of Longwood Seminar are not suitable references. 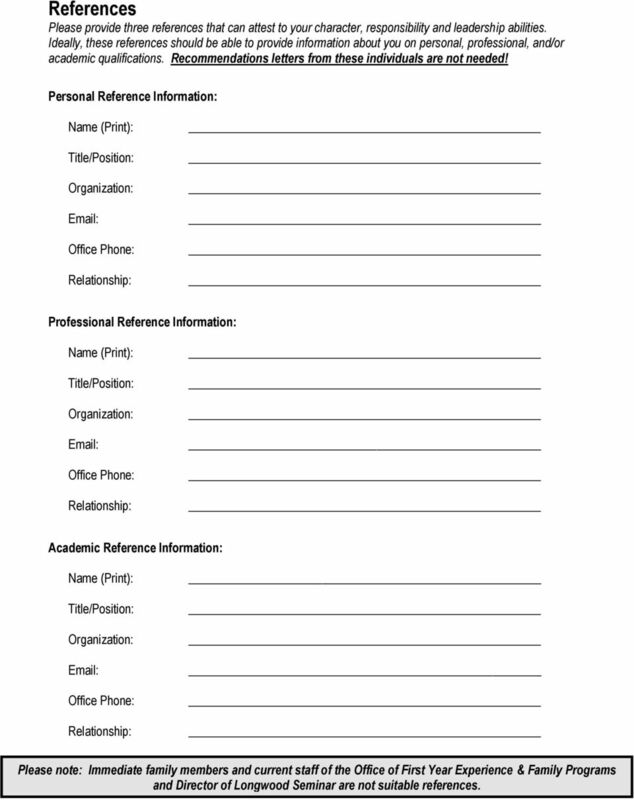 2010 Orientation Student Leader & First-Year Seminar Leader Application Packet Thank you for your interest in Western Michigan University s Orientation and First- Year Seminar Student Leader positions. NOTE: You must receive confirmation of your interview day/time FROM R&SS CENTER STAFF in order to be part of the interview process. 4 PM 4 PM 6 PM 6 PM 6 PM. SUMMER ORIENTATION LEADER POSITION DESCRIPTION Role Description - The Orientation Leader is a paraprofessional who is expected to assume leadership responsibility for the success of the orientation program. Thank you for your interest in the Student Orientation Staff (SOS) member position for Marymount College s fall 2013 Orientation! Application Deadline: Friday, April 8, 2016 at 12:00pm. Will only accept application in-person or by mail postmarked by April 8 th.